The passenger jets that recently crashed in Ethiopia and Indonesia had something in common: They lacked safety features that could have helped prevent the deadly accidents, which Boeing charges extra for, the New York Times reported on Thursday. The optional safety features – an angle of attack indicator and a disagree light – are not mandated by the Federal Aviation Administration and are currently only installed if the airline pays for the add-ons. Both upgrades were related to the plane’s angle of attack sensors, devices that read whether a jet’s nose is pointing up or down relative to oncoming air. One upgrade, called the angle of attack indicator, displayed the sensors’ readings; the other upgrade is a light that is activated if the sensors interfere with each other. The disagree light alone cost $80,000, according to CBS; the jet’s list price is roughly $120 million. As investigators look into the cause of the crashes, attention has turned to new software in the jets that takes readings from devices called angle of attack sensors. The software can essentially push a plane’s nose down in some circumstances, for example when the sensors suggest the plane may be stalling. Boeing will now make the disagree light free of charge as part of a forthcoming software update to the 737 MAX fleet in the wake of the two fatal crashes, officials briefed on the matter said on Thursday. The manufacturer will also retrofit older planes with the light that did not initially receive it. 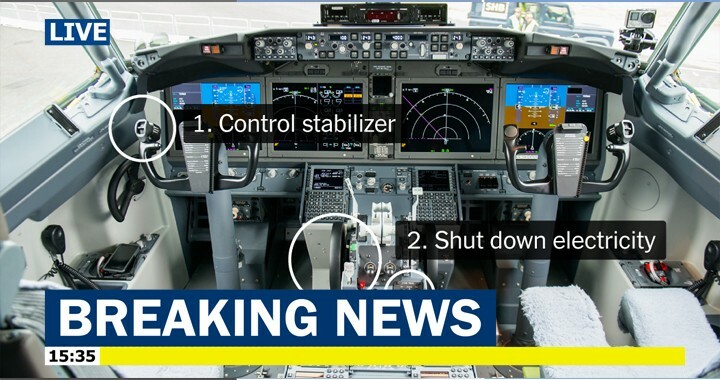 The angle of attack indicator will remain a feature that airlines can add on, officials said. The faulty angle of attack sensors was blamed, in part, for the Indonesia disaster last October that killed 189 people. The sensors have also been at the center of initial investigations into this month’s Ethiopia crash in which 157 died. While the two features missing from those two planes are not required by regulators, experts said they were key to safety. ‘They’re critical, and cost almost nothing for the airlines to install,’ Bjorn Fehrm, an analyst at the aviation consultancy Leeham, told the New York Times. The feature is sold at an extra cost, which means some budget airlines like Lion Air have chosen not to fit them. The March 10 Ethiopian Airlines crash has set off one of the widest inquiries in aviation history and cast a shadow over the Boeing 737 MAX model intended to be a standard for decades.